We’re taking the road less traveled, winding our way through the hot countryside and pine forests of Chile. Every now and then we hop on Ruta 5 heading south a few kilometers to the next main town, or to catch another secondary or tertiary road. Occasionally we go hours and see only a few cars, horses and carts sometimes outnumbering motors. On the most deserted routes, we have CGL125 races, pretending to peddle up the hills at a glorious 40mph. We left Santiago on January 7th, exactly one month before my 30th birthday, and spent our first evening in the beach town of Pichilemu amongst the most stereotypical airhead surfers one could imagine. The next morning we meandered through more countryside until we reached Talca, a town not really worth seeing, save for the two nights spent at the beautiful German run garden of Eden hotel/hostel, Casa Chueca. We lounged by the pool on hammocks, enjoying the lush green surrounds and complimentary breakfast bounty. From Talca we headed southwest then southeast, the long way but avoiding Ruta 5, to Cauquenes, Quirihue, San Nicolas, and finally to the outskirts of Chillán (pronounced “chillin’” by Aussie Rob). We pitched our tents at the overpriced campground Rey Mar, a swimming pool and waterslide haven for local kids with attached field and discotech. At our arrival, a long haired little hoodlum old enough to be witty and sarcastic chanted “Pi-zza! Pi-zza! Pi-zza!”, mocking our little CGL125’s. Hardy-har, kid! We rolled on to find a spot. Our nearest neighbors, a group of rowdy drunk Chilean men, blasted regatón music and worse until at least 3am. I lost my earplugs in my sleeping bag and spent most of the night on a search and rescue mission. The gentleman were up by 9:30am, blasting the same soundtrack all over again. By 10:30am we were back in Chillán, sweet-talking the local Honda dealer to do our 1,000km free service right then and there, not wanting to wait around an extra day. By 1pm we were on the road again, this time escorted by two of the Honda mechanics ditching their clients and duties, eager to partake in a bit of our adventure. The road led us to Chillán Viejo, Pemuco, Yungai, Huépil, Canteras, Antuco, and finally to the outskirts of the Parque Nacional Laguna del Laja. The perfect cone shaped Volcán Antuco loomed at 9000 feet, welcoming us to the cordillera de los Andes, 750km from our starting point 5 days before. We booked ourselves a two bedroom cabin for $60USD/night and spent the rest of the evening swimming and cherry picking in the orchard in the shade of mountains and glaciers. The next day we hiked to waterfalls in the baking Andean sun, bathed in a volcanic lake, and lounged by the “espejo de agua”, the unlicensed pool the proprietor here made next to the cherry trees. To recap: Kath and Rob have been planning this trip for quite some time, saving for the last few years for their year adventure. 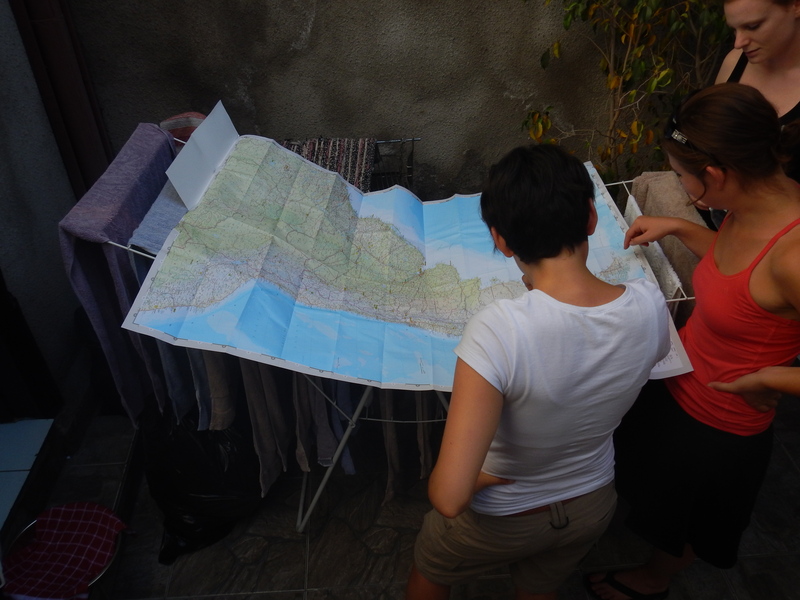 At Christmas, a mere two weeks ago, I decided to join them on some of their adventure, and a week later I was on the plane to Santiago! Because… well, why not? Rob and Kath, recent Mr. Money Mustache converts, were all for buying the cheapest (good) bikes we could get. It was a tough choice between the Honda XR125 and the CGL125, but with the CGL coming in a grand cheaper at only $1,150USD for a brand new 2014 from ProCircuit in Santiago, our frugal ways just couldn’t resist. And we loved the retro look. We paid $250 for registration, plates and insurance and for someone knowledgeable to do all the paperwork for us (at $20 more each, it was well worth the extra cost). In just a few short days, we were on our way! We’re still waiting for our pardon, the document that will allow us to leave Chile with the bikes. 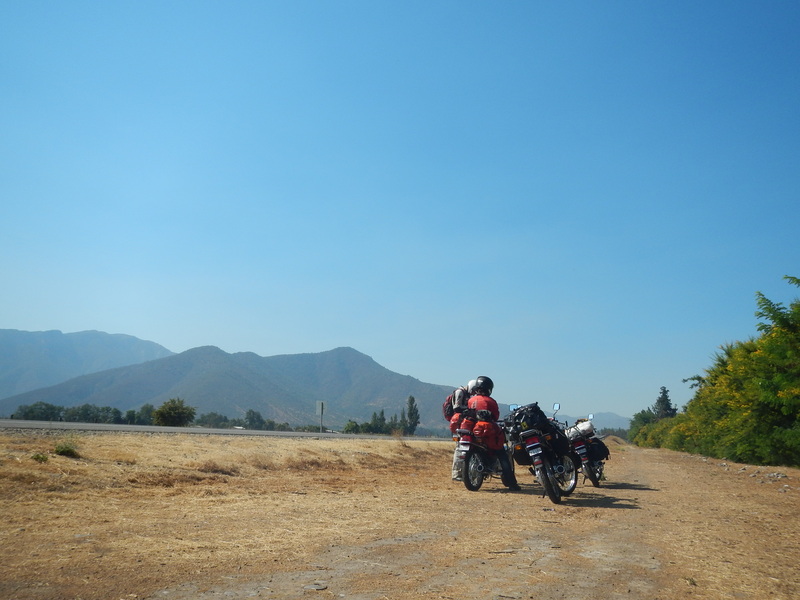 Previous PostPatagonia Bound: CGL 125 first days on the roadNext PostCGL 125 Photo Update: Cordillera de los Andes en Mini-Moto! In Temuco, remember that it was the land of the two great poets: Pablo Neruda y Gabriela Mistral. We’re following your Chilean travels with great interest. The backroads and small towns are fascinating, and it sounds as if you are all happy with your new bikes. Glad the little bike is forcing you to slooooow down :) Keep the updates coming!